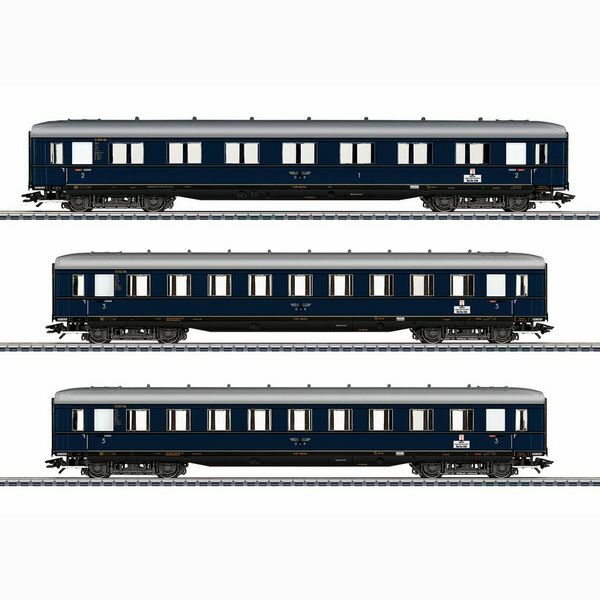 Prototype: 3 different express train apron cars of different designs, in fictitious steel blue version of the Deutsche Reichsbahn (DR). 1 apron car AB4ü, 1./2. Class, 2 apron cars C4ü, 3rd class. Operating condition in the late 1930s. Model: Full length scale. Type-specific designed subfloors. Bogies of the type Görlitz easily. Trafficable minimum radius 360 mm. All trolleys prepared for current carrying couplings 7319 or current separable short couplings 72021 as well as for installation of interior lighting 73150. Overall length over buffer 74.3 cm. DC wheel set per car E700580.